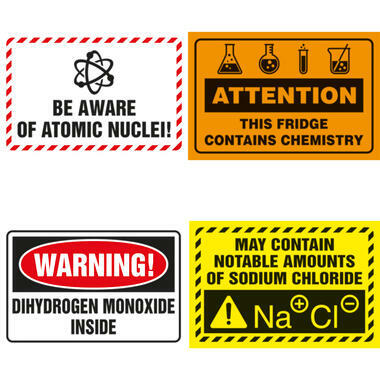 The Chemistry Warning Fridge Magnets allow you to play similar pranks in your own kitchen on non-nerdy guests or flatmates: Each set contains four fridge magnets that are modelled after actual chemical warning signs and warn against dihydrogen monoxide, chemistry, sodium chloride and atomic nuclei. But don't worry, these are actually terms for completely harmless things you can find in every single kitchen. Dihydrogen monoxide is another term for water and not actually used by scientists outside of jokes, chemistry happens in your groceries (and basically every other thing), sodium chloride is plain, old salt and atomic nuclei are also present in everything in existence. 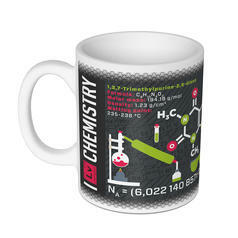 9,95 € lade... Science Mug Chemistry This mug combines your two favourite things: coffee and chemistry! 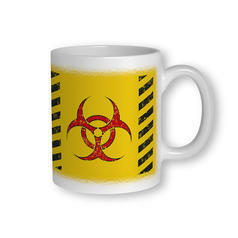 9,95 € lade... Biohazard Mug For your morning dose of zombie virus! 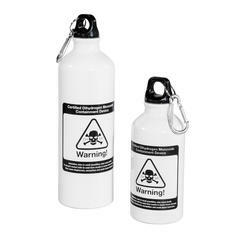 vanaf 9,95 € lade... Dihydrogen Monoxide Bottle with Carabiner With this canteen, you can safely carry dangerous DHMO around with you!